Essentials of Correctional Medicine was held last week in Salt Lake City, Utah and included some great talks. Today’s post is a list of Pearls I gleaned from the conference speakers. The definition of a “Pearl” is a bit of pithy and insightful information that can be communicated in one or two sentences. Hopefully, it is also something that you have not thought of yet and will change your practice for the better. Inmates can abuse albuterol because it is an alpha-adrenergic chemical, and so can create a high. The way that this is typically done is this: the inmate sprays the inhaler onto cloth, like a sheet or a shirt-sleeve, until the cloth is saturated. The albuterol dries as small white flakes, which are then snorted. Asthmatic inmates often improve when they become incarcerated because they stop smoking. Often, asthmatics will need less medication in jail than out of jail. Spacers improve the efficacy of inhalers by 2-3 times but are seldom used because they are so expensive, $35.00. However a new spacer is now on the market that is made of cardboard, disposable and inexpensive, 50 cents apiece. You can assign one of these with each inhaler, write the inmates name on it and use it with each inhalation. When you take a blood pressure, make sure that the patient’s legs are not crossed and that his arm is relaxed at his side. Crossing legs or holding up an arm can artificially elevate a blood pressure by as much as 15 points. The standard of care per the JCIS-7 guidelines for the diagnosis of hypertension is at least two readings three months apart. Since we have such easy access to patients in corrections, sometimes we diagnose hypertension prematurely. You don’t have to prescribe anti-hypertensives after one reading. Atenolol is an inferior blood pressure agent. Do not use it. Use metoprolol or carvedilol instead. Chlorthalidone may be a superior diuretic blood pressure agent to HCTZ. Use the ABCD rule. A stands for ACE inhibitor. B stands for Beta Blocker. C stands for Calcium channel blocker. D stands for diuretic. A and B agents are one team and, as a rule, should not be prescribed together. C and D are another team and should not be prescribed together. Instead, combine A/B with C/D. The best agent to use for refractory hypertension is spironolactone. Add it to the diuretic the patient is already on. The community standard of care (in ERs and Psych hospitals) is that chemical sedation is safer and more effective medically than prolonged physical restraint. Issuing glucometers to Type 2 diabetics in prison does not change HbA1Cs compared to no glucometers. There appears to be no advantage to giving glucometers to Type 2 diabetics in prison. The most effective Type 2 diabetic program at the Utah DOC was a chronic care visit with a nurse every four months. Be careful with lancets! They can be used for tattoos. Pseudoseizures is a bad term. It sends a mixed message to patients: “You don’t have seizures, but you have seizures.” Psychogenic attacks or psychogenic episodes is a better term. One effective way to deal with psychogenic episodes is to tell patients that it is OK to have them (but then don’t pay any attention to them). Inmates often write complaints to licensing boards—such as the State Medical Board for physicians and the State Nursing Board for nurses. Since these are not malpractice complaints, doctors and nurses often think they should respond to these by themselves. Wrong-O! Don’t advocate for yourself in a Board complaint. Notify your facilities attorney about these complaints; they can help you tremendously. That’s their job. Correctional facilities sometimes use nurses to staff sick call clinics without provider back up. This is contrary to the community standard. Can you imagine going to a clinic or your doctor’s office because you were sick and seeing only a nurse and leaving with a prescription? On the other hand, visits to chronic care clinics in correctional facilities are mainly staffed by practitioners, whereas in the community, they are mostly staffed by nurses. It would be appropriate to expand nursing roles in chronic care clinics. 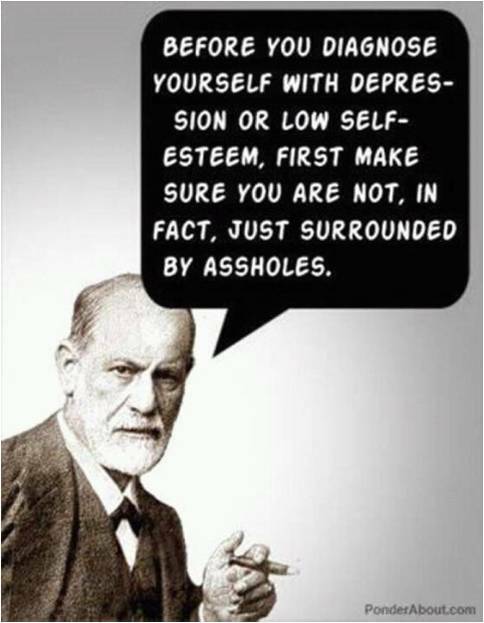 Best quote of the conference: “Before you diagnose yourself with depression or low self-esteem, first make sure you are not, in fact, just surrounded by assholes.” This is especially true of those thrown into a jail dorm of 60 guys, over half of which are antisocial predators! It is almost impossible to make accurate psychiatric diagnoses on newly incarcerated inmates. There are too many complicating factors, such as drug withdrawal and stress and anxiety about jail housing and the legal charges that landed them there. Wait at least a month in most inmates to make a diagnosis. Inmates often want you to solve their problems. Do not accede to this role! Your job as a counselor is to show them ways to help themselves. Give them homework. Who is the biggest drug dealer in your facility? Medical. We need to know the psychiatric drugs that can be abused and avoid them. There is always a just-as-good alternative. Examples: Wellbutrin, Seroquel, Stimulants, Tricyclics. When you see someone with a sudden change for the worst, think about the possibility of smuggled in drugs. Never say “We don’t treat that.” Example is insomnia. We treat insomnia using a sleep hygiene program. We even use sedating drugs in appropriate settings, like the manic patient who has not slept in 3 nights. Calling Diets “Special,” as in “Special Diets,” can make them especially desirable for inmates. Instead, call them “Restricted Medical Diets.” There will be less demand from that change alone. The national trend among correctional facilities is for fewer calories, less salt and more fiber. Katie discusses this in her blog, found here. It is better and cheaper to have one healthy diet for almost all inmates than a “regular” (meaning unhealthy) diet and then lots of “Restricted Medical Diets.” For example, don’t put a lot of salt in your regular diet and you won’t need a “Low Salt” diet. Maricopa County Jail in Phoenix will test any inmate for any stated allergy, but if the test is negative, they charge the inmate for the test. Demand for the tests has dropped immensely. It is more important to reduce blood pressure in Type 2 diabetics than to reduce blood sugar. This is a small sampling of the pearls from this conference. What Pearls did you glean from this or any other recent conference? Please comment and share! This entry was posted in Conference, Diabetes, Drug Evaluations, Drugs of Abuse, Food, Inmate issues, Jail culture, Medical Economics, Medical Practice, Mental Health, Pharmacy, Practice Management, Psychiatry, Withdrawal Syndromes and tagged Antidepressant, Conference, correctional medicine, Diabetes mellitus, evidence based medicine, inmates, jail medicine, jails, pharmacy practice, prisons on November 13, 2012 by Jeffrey Keller MD. Thanks for sharing for those that did not get to attend. Was there any audio or video that can be obtained for review? Thanks for the interest, Melinda. We are editing the video of the conference as we speak! The conference was graet!! When will the video be out? I want the rest of our staff to see it. Coming, Kathleen! It is almost done being edited. We will let you know by email! I really like the comments about correctional counseling, particularly the stressor of being “surrounded by assholes” which is easy to forget. This will be helpful to my practice, in which I encounter patients in a state psychiatric hospital who have been transferred from the jail, appeared to be suicidally depressed and/or psychotic when seen in jail, sometimes display few or no symptoms once at the psych hospital. These aren’t necessarily malingerers; in fact, some of them HATE being in the psych hospital and say, “Ship me back to jail!” I guess they would rather be surrounded by “assholes” than state hospital patients. Interesting point, Jeff! I have seen more of the other sort, who view a stay at the State Hospital as “easy time” and like to go there. Most are not malingering (though I have suspected a few). Because Type 2 is a condition of insulin resistance, so the body is not using their own insulin properly. Duh.